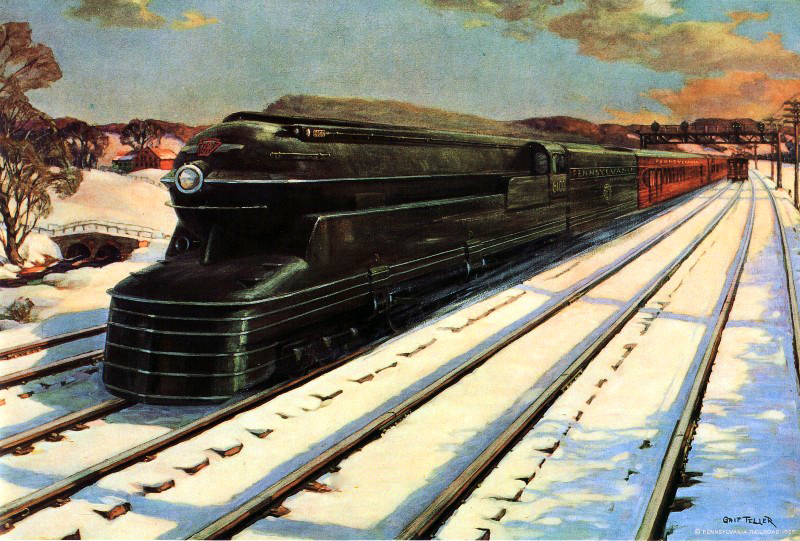 The "Fleet of Modernism" was simply a marketing ploy by the Pennsylvania Railroad for its brand new streamliners which debuted in the late 1930s and initially included four different trains. 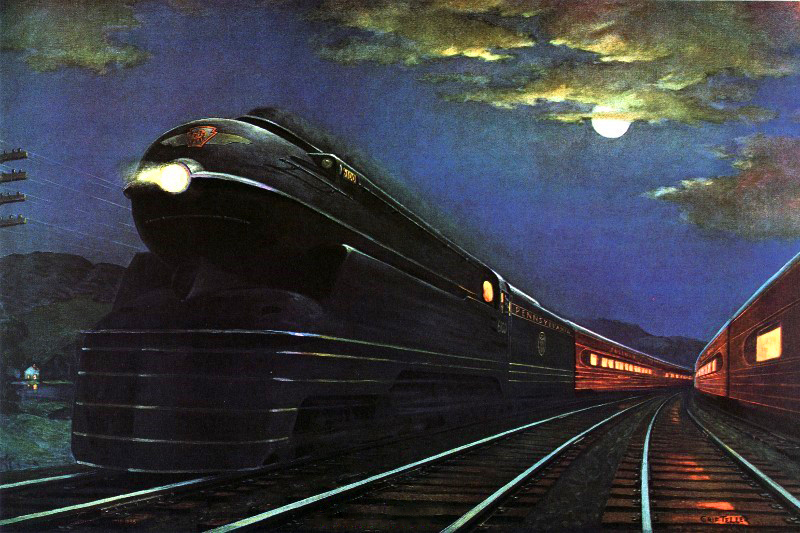 The idea of describing its new trains in such a way was not only to distinguish itself from rival New York Central (which had its own named streamliners, the "Great Steel Fleet") but also to let the traveling public and its loyal riders about the upgraded features. Originally, these trains only included the PRR's long distance runs between the East Coast and Midwest connecting cities such as Chicago and St. Louis to Washington, D.C., Philadelphia, and of course New York. By the early 1940s the Pennsy had expanded the fleet although by just a decade later it began discontinuing them as traffic declined. Just two remained through the start-up of Amtrak with the Broadway Limited surviving until the mid-1990s. The streamliner revolution had been underway within the railroad industry since the 1934 debuting of the Burlington's Pioneer Zephyr and the Union Pacific's M-10000, which were both introduced to the public that spring. At the time the PRR took a conservative approach to the new fad, primarily because it was unproven and the railroad was naturally slow to adopt new, contemporary ideas (which was also true for most of the industry, in general). However, with the New York Central announcing it would be upgrading its 20th Century Limited to full streamliner status the Pennsylvania could certainly not let its main rival have the upper hand. As such, the PRR made plans to not only update its flagship, the Broadway Limited but also three other long distance trains. 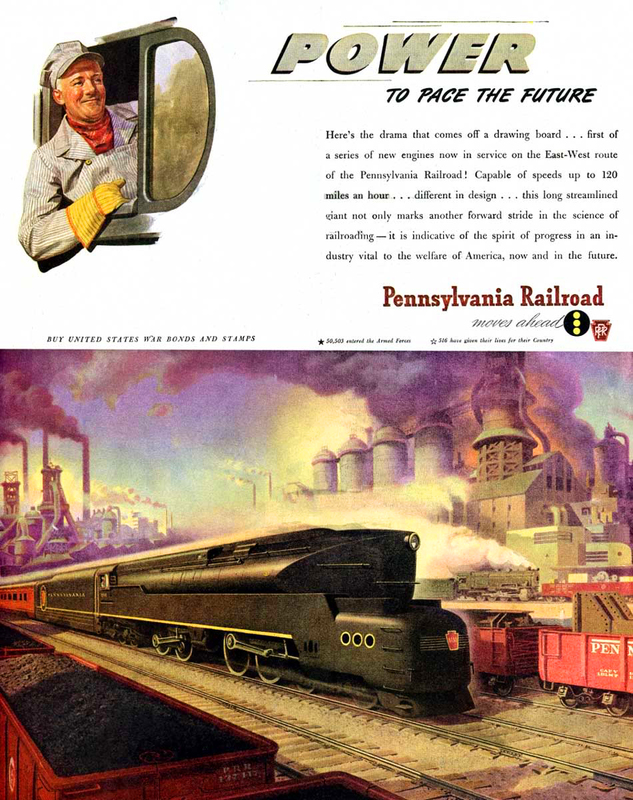 Officially, the Pennsy's "Fleet of Modernism" hit the rails on June 15, 1938. The railroad had ordered 52 new, lightweight and streamlined cars from Pullman Standard. This equipment completely streamlined the Broadway while the rest of the fleet was partially so and included the Spirit of St. Louis (New York - St. Louis), General (New York - Chicago), and Liberty Limited(Washington - Chicago). For power the trains utilized either Class K-4s Pacifics or one of the railroad's Duplex Drive steam locomotives (such as the T-1, S-1, Q-1, or Q-2) west of Harrisburg, Pennsylvania (east of the city the railroad utilized its new GG1 electrics). The Pennsy spent lavishly to promote the trains to the public printing many different colorful and elaborate brochures highlighting the individual trains as well as the fleet in general. The appearance of the fleet's trains were thanks in large part to industrial designer Raymond Loewy. The railroad would tap Loewy for numerous design enhancements throughout the streamliner era that included things like the above mentioned GG1 and steam locomotives including the Duplex Drives. Of course, he was always best known for his streamliner work and he did a marvelous job with the Pennsylvania's trains. For the exterior Loewy featured a soft red known as Tuscon, somewhat resembling red clay. He coupled with this a gold trim with likewise lettering that gave the cars a stunning elegance. When the Pennsylvania Railroad later purchased diesel locomotives in the late 1940s, "Cat Whisker" pinstripes added to them made for a breathtaking train. From an interior standpoint Loewy stuck with the overall soft theme going with blues and yellows. 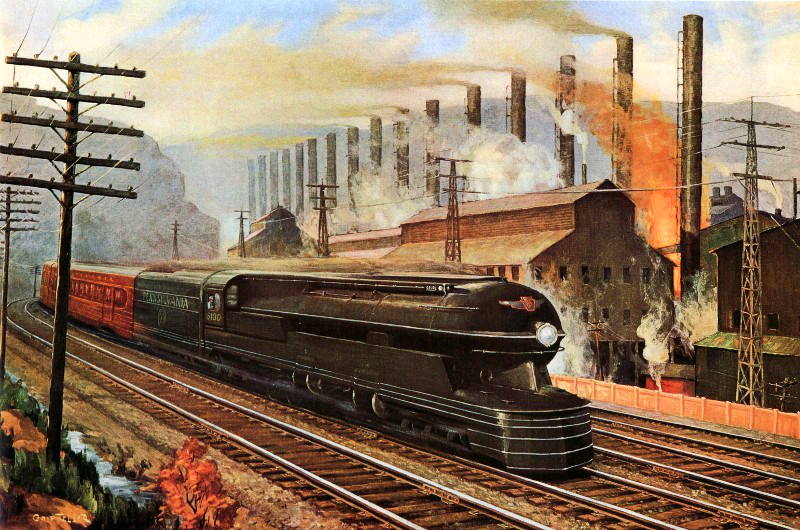 In general, Pennsy's fleet of streamliners were a significant contrast to the New York Central's dark aurora of exterior greys and similarly "hard" interior colors. After the fleet debuted the PRR soon added to fleet. On July 28, 1939 the railroad debuted the new Trail Blazer, an all-coach streamliner serving New York and Chicago. Then, on April 27, 1941 the new Jeffersonian was introduced between New York and St. Louis, another all-coach affair. These trains utilized older heavyweight cars that had been rebuilt to streamliner status. Additionally, the PRR rebuilt even more older cars to completely reequip its original fleet to full streamliner status. Other trains that became part of the fleet included the Red Arrow, Cincinnati Limited, Pennsylvania Limited, Pittsburgher, and the Manhattan Limited. Around 1947 the Pennsy began purchasing new diesel locomotives from the American Locomotive Company (PA), Baldwin (DR-6-4-2000), Fairbanks Morse (Erie Builts), and Electro-Motive Division (E7s and E8s) as new power for its trains. It was also around this time and through the early 1950s that the railroad purchased all new lightweight equipment from Pullman Standard to upgrade all of its premier runs with better cars. Unfortunately, by this time public interest in rail travel was on the decline and had accelerated to such a pace that by 1950 the Trail Blazer was combined with the General and in 1957 the Liberty Limited was dropped altogether. Throughout the 1960s consolidations and cancellations continued until by the Penn Central merger only the Manhattan Limited, Spirit of St. Louis, Pennsylvania Limited, and the flagship Broadway Limited remained on the timetable. Following the era just after World War II the PRR boasted nearly sixty schedules of its so-called "Blue Ribbon Fleet," or those trains that were considered its preeminent services, ranging from the General to the Akronite. After the startup of Amtrak on May 1, 1971 only the Spirit of St. Louis and Broadway Limited remained. In July of that year the Spirit was cancelled while the Broadway survived with Amtrak until 1995.